NBN Co and Telstra sign historic agreement. Telecommunications incumbent Telstra has agreed to migrate its copper and cable broadband networks to Government-owned NBN Co in a deal worth $11 billion. The two parties have signed a financial heads of agreement, announced Sunday, that will provide NBN Co with access to Telstra's passive infrastructure (pits, ducts and backhaul fibre) and eliminate Telstra as a fixed-line wholesale competitor to the Government-owned entity. Telstra, in turn, has been given assurance from Prime Minister Kevin Rudd that it can compete in auctions for 4G [LTE] mobile spectrum and face less regulation from the Federal Government. The deal would need to be approved by both Telstra shareholders, the Federal Parliament and competition watchdog the ACCC. The assets to be transferred as part of the deal were valued at $9 billion, whilst Telstra values the financial gain from "public policy reforms" signed as part of the agreement at $2 billion. The $9 billion will be paid progressively as Telstra's copper network service is decommissioned and cable broadband network service deactivated. 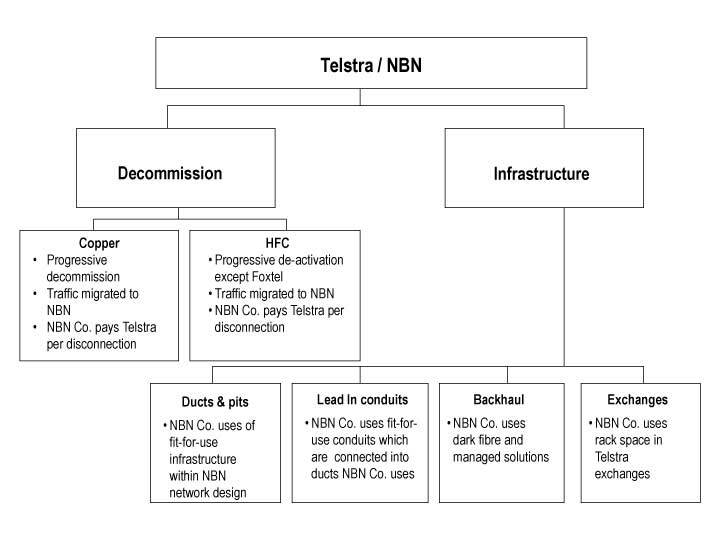 NBN Co will pay Telstra a fee for every customer migrated from these networks onto NBN Co's fibre network (upon which the figure of $9 billion was assumed). "Telstra has received written confirmation from the Prime Minister that Telstra would be able to bid for Long Term Evolution (LTE) wireless spectrum should the transaction be completed and that sufficient regulatory certainty will be provided on a range of matters for NBN Co and Telstra to enable the transaction to proceed," the telco said in a statement. Telstra will maintain its cable network exclusively for the purposes of its Pay TV joint venture, Foxtel. Should the deal go ahead, Telstra will no longer be required to meet most of its Universal Service Obligation costs. The Federal Government plans to create a new entity called "USO Co" to ensure the needs of regional Australians continue to be served, which will take over the Universal Service Obligation from July 1, 2012. USO Co will be provided $50 million of funding in 2012-13 and 2013-14, but will be granted $100 million per year in future years. The Government indicated that the telecommunications industry may be required to also contribute to funding USO Co, "subject to industry and stakeholder consultation." The Government will also provide Telstra $100 million for the "retraining and redeployment" of Telstra staff. Further, the Government said NBN Co would be the "wholesale supplier of last resort" in Greenfield (new) housing estates from January 1, 2011. Whilst describing the agreement as an "important step", Telstra chief executive David Thodey warned that there were significant conditions attached. "A very significant amount of work must still be done on many complex issues," he said. The two parties are yet to work out the finer details around "migration processes, taxation, the future of legacy regulations applying to Telstra and the consequences of any major changes to the NBN rollout schedule." Further, the heads of agreement is conditional upon the Government passing legislation and the deal being approved by the Australian Competition and Consumer Commission (ACCC). "Accordingly, there can be no guarantee at this time that the transaction will progress to completion," Telstra said in a statement. NBN Co chief executive Mike Quigley described the deal as a "sound outcome" for the company charged with building a national fibre network. "When finalised, it can maximise the use of existing infrastructure and accelerate the roll out of its network," he said. "It also means Telstra is likely to become NBN Co's largest customer as it progressively migrates its voice and broadband traffic to NBN Co's wholesale-only, open-access network, providing greater certainty about future revenues."